With Russiagate and the Kavanagh confirmation hearings consuming all of the mainstream media’s “bandwidth”, there is one very important aspect of Washington that is getting a pass from the media. With Donald Trump having promised to “drain the swamp” and with the Republicans supposedly being the party of fiscal prudence, the latest press release from the United States Treasury Department should cause American taxpayers to question whether anything has really changed in Washington. As you can see, after growing to $1.413 trillion in fiscal 2009 and hitting $1.294 trillion in fiscal 2010 and $1.299 trillion in fiscal 2011, the federal deficit declined to a post-Great Recession low of $438.5 billion in fiscal 2014. Since then, the deficit has started growing again, hitting $665.4 billion in fiscal 2017 indicating that Washington is, once again, showing its true fiscal abilities. 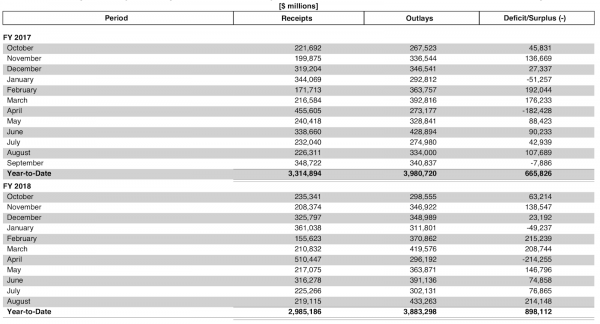 During one month alone, Washington had total outlays of $433 billion against total receipts of $219 billion leaving a shortfall of $214 billion or roughly one-third of the total deficit in fiscal 2017. 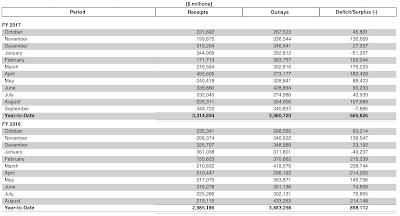 Outlays totalled $3.883 trillion against total receipts of $2.985 trillion leaving a shortfall of $898 billion, a deficit that is now 35 percent higher than the deficit in fiscal 2017. 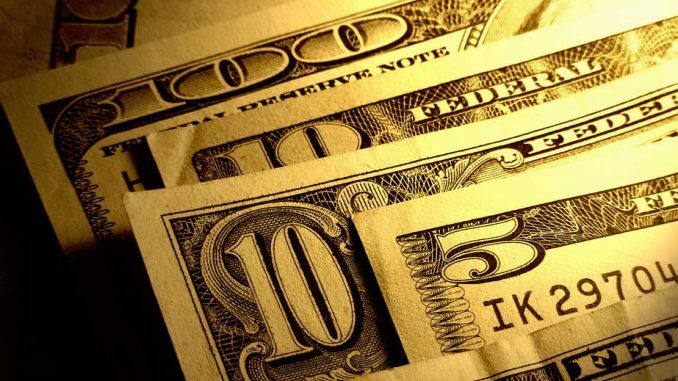 Despite low interest rates, since the beginning of fiscal year 2018, Washington has paid out $332 billion on its current debt, an amount that consumed most of the federal government’s income from corporate income taxes, duties and taxes other than individual taxes and Social Security and other payroll taxes which totalled $393 billion. As we can see, little has changed when it comes to Washington’s spending habits. It seems that no matter which party holds the reins of power, irresponsible fiscal management is the order of the day with the federal government, an issue that is likely to become worse with the impending tax cuts.